Roll leaf is a great time saver that allows you to unroll the leaf on to the prepared surface, rather than placing a series of individual leaves. It is frequently used for gilding long stripes, or large areas. Double roll gold is available in genuine 23k gold in various widths from 1/4” wide up to 3 inches. Each roll is 67 feet long. 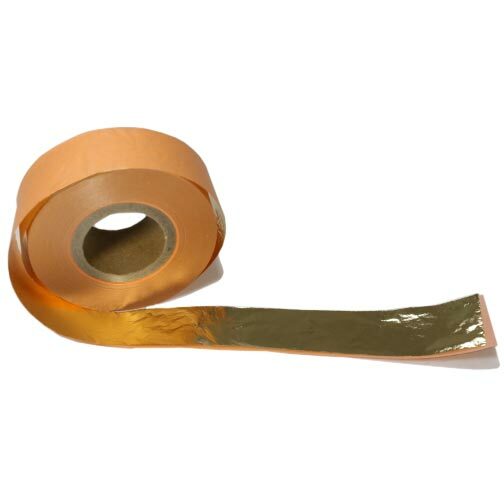 Imitation gold rolls, imitation silver rolls and genuine copper rolls are available in widths starting at 1/2 inch and go up to 6 inches. Imitation gold rolls, imitation silver rolls and copper rolls are 164 feet (50m) long, and must be sealed to keep from tarnishing. Special orders can be placed for genuine 12k, 18k, 22k, 23.75k and 24k roll gold. 3-inch wide, 67-feet long, master rolls are made from loose leaf and are then cut to the requested widths. The special order gold rolls are generally available within two weeks. Please contact us for more information.